"ትግራይ ለመገንጠል ብትፈልግም ብቻዋን ስለሆነች ብርድ ብርድ እያላት ነው!!" የሱማሌ ክልል ምክትል ፕሬዚዳንት ሙሐመድ ሙስጠፋ!!! "በህግ የሚፈለግ ተጠርጣሪን ደብቆ አልሠጥም ያለው የእኛ ክልል አይደለም። የፌዴራል ፓርላማ ያወጣውን ህግ አልቀበልም ያልነው እኛ አይደለንም። የመገንጠል አጀንዳ ይዘንም የምንቀሳቀሠው እኛ አይደለንም። ምናልባት ሊገነጠሉ የሚፈልጉ ሀይሎች ብቻቸውን ሲገነጠሉ ብርድ ብርድ እንዳይላቸው ሡማሌ ክልልም አብሯቸው አጀንዳውን እንዲያራግብ ይፈልጉ ይሆናል። ግን አይሳካላቸውም።"
Re: "ትግራይ ለመገንጠል ብትፈልግም ብቻዋን ስለሆነች ብርድ ብርድ እያላት ነው!!" የሱማሌ ክልል ምክትል ፕሬዚዳንት ሙሐመድ ሙስጠፋ!!! Killil Somali president is funny and real. Great cursed-land-tigray dream died with midget frog evil meles. Tigray is stuck with idiot halafi and [email protected] addict idiot [email protected] . WEEY GUUD BELE tarik.
. RIH. REST IN HELL AGAME MELES. Ke egna behula ye Ethiopia menorm atratari new,negusu alut kemibalew.sle nante menager be kum memot new. Last edited by Degnet on 09 Feb 2019, 03:15, edited 1 time in total. I really have enjoyed his statments . He seems to be a straight shooter. What a change! The Sebhat dynasty had a hard time accepting that they no longer have a willing servant to take orders. 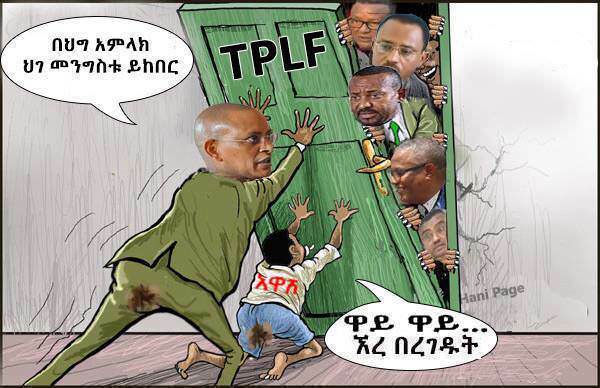 But I disagree with Mohamed in one point: The Sebhat dynasty has no intention to secede Tigray. It is what they play as a political game. Ethiopians should not fall for the ploy. Let us say they made their proclamation of independence from Ethiopia, what a joke! How does Tigray operate as an independent nation. Isayes cannot stand them. Ethiopia, well, they just divorced from her. Sudan, well, the president of the country is not sure a week from today that he will remain as a president of the country. He pretty much knows he cannot afford to lose the friendship of Ethiopia to have a friendly relationship with the new tiny Tigray. I was in Sudan when TPLF totally liberated Tigray from the Derg control. That was when they were totally confused. That was when they started to just breeze in the socialist politics. They realized with ninety percent of Tigrean farmers as their source of primary economic means, having no outlet to the outside world by sea, having no connection with the world by air, they resorted to be friendly with Ethiopians again. And then they started to create the Berket Simon Amhara and the Abadula of Oromo. That past will not be repeated. No, Tigray will not secede because Tigray needs Ethiopia more than Ethiopia needs Tigray. He was referring to the agame Hawdien, Zack, Khysion when he said agame's misery loves company. You got to love this guy! Revelations, thank you very much for posting this video!!! At least make one of the lions a lioness that way they, potentially, might date. And make sure to make TPLF wolf. Both of you are our last target.To be or not to be.